Sonia Martinez started blogging in August 2006. She authored a cookbook, “Tropical Taste,” which largely compiled recipes that appeared in the Hamakua Times. 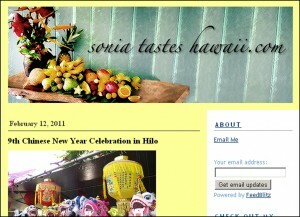 With Sonia Tastes Hawaii, she aims to “share my world of food, gardening and cookbooks with you.” She brings her Cuban culinary heritage and knowledge of Hawaii produce and products together in her photo-rich blog, which covers food, farm, and community events on the east side of Big Island, as well as home kitchen-tested recipe reviews.